The final installment in the acclaimed Halo franchise to be made by the now famous Bungie, Halo Reach looks to draw you into yet another addition to the long running series, but can Bungie's last Halo title close the show with a bang? Telling A Story...We Already Know: Halo Reach tells the story of "Noble Team", a group of elite soldiers who are often sent out on substantially important missions that must not be failed. You play as the latest member of Noble Team, the sixth member of the squad and a new recruit. 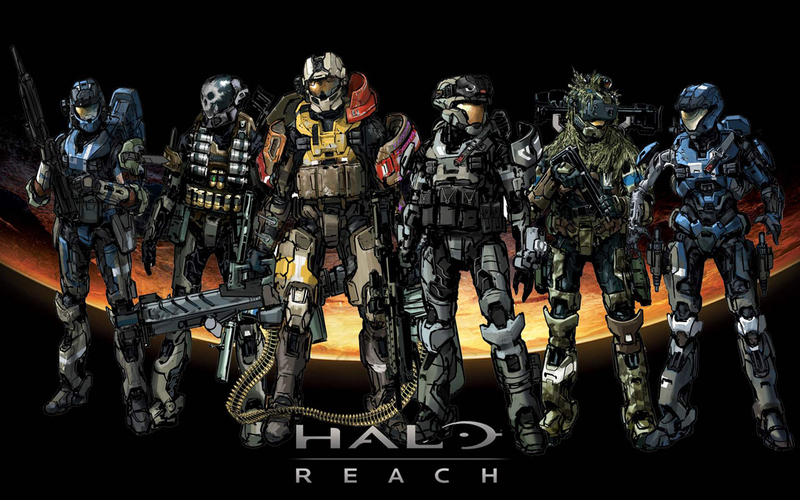 The story of Reach revolves around Noble Team being sent on a mission to investigate the Planet Reach. Originally thought that Planet Reach's disturbances were being caused by rebel soldiers, it is soon revealed that the Covenant (an alien race and the enemy of every single Halo title), are the ones assaulting the populace on the planet and causing a whole lot of trouble. While the narrative of the Halo titles have always been a pretty crucial part of each game, even going all the way back to Halo: Combat Evolved to newer installments like Halo: ODST, Reach seems to have a slightly larger focus on the storyline. There are more cinematics throughout the campaign, and aside from that the entire game feels like it is relying on the story a bit more then is usually the case in the Halo games. I believe this is a welcome addition, and the more engrossing plot adds just a bit more to the title in my opinion. The main goal of Noble Team ends up being to keep Planet Reach from being invaded and conquered by the Covenant, but anyone "into" the Halo franchise already knows what becomes of the Planet Reach. From the books to just the earlier games in the series, it is mentioned what happened to Reach and how that affected everything else in the storyline. I'm not going to spoil what happens to the planet and whether or not it is conquered by the Covenant, but I do think it is a tiny bit of a disappointment to basically know a bit about the ending of the game (if you've kept up on previous titles or books). Mayhem At Its Finest: Halo Reach, like every other first person shooter and every other title in the storied and long running franchise (Reach is the fifth title in the series), has a large emphasis on combat and gunplay. I am very happy to report that Reach manages to maintain the enjoyment of the firefights, and despite using the same basic gameplay (combat wise) as Halo: Combat Evolved, which came out many years ago for the original Xbox! The combat is still very fast paced and action packed, and while there are not many new additions as far as cannon fodder goes, the gameplay is still incredibly enjoyable and for some reason manages to maintain itself even after so many years. Why Do I Always Have To Drive: Aside from the actual shooting goes, a big part of what makes Reach still feel fresh and just plain fun is the improved AI of your enemies. Grunts (the weakest breed of the Covenant) will bunch together in massive numbers and are a bit more capable then they have ever been. They will avoid grenades and are not very easily flanked, and their mass numbers make them a formidable foe, especially on the higher difficulties. Jackals (weak, but they have a protective shield) will also team up to attack you and their shields are not as easily blown out as they were in previous Halo games. Some of them throw grenades and they are quite accurate as well, and they often team up with other breeds to form a mini-army. The large and agile Elites are relentless in their attack and possess powerful weapons that can pick you apart very quickly, and surprisingly enough they also often have weaker breeds as companions and teammates when attacking you (as in, an Elite and a Grunt will be together). The AI for the enemies as a whole has received a much welcomed boost, and they use more intelligent tactics throughout a battle. While it is easy to mow down a dozen Grunts in a few seconds, there are just so many enemies on screen at one time attacking you that you will often find yourself hiding behind cover and looking to make a more strategic approach during a shootout. Not something you normally expect from a first person shooter. Unfortunately, while the enemies' AI has improved, I do not see much improvement in the intelligence of your allies. Your other Noble Team members (the other five) are somewhat bright and will use cover and lay down a good amount of fire when needed, but at times they get in the way (run in front of your crosshair, causing you to shoot them) and also have an annoying habit of forcing you to lead. For some reason you (the new guy on the team), usually has to be the first to go here or do that. As far as the common foot soldiers you will fight alongside with go, they are just plain idiotic. They shout that enemy vehicles are approaching, when there is really nothing coming after you. As well as that, your comrades are not very effective in combat either. They basically just stand around while you rip everyone to shreds, and offer little support when it comes to handling bigger groups of enemies. And don't even get me started on their driving. AI driving has been infamously terrible in the Halo franchise, and it is not much better in Reach either. If you allow your allies to drive, expect to run into rocks, trees, walls, or pretty much anything in the environment and don't be surprised if your ace driver even runs over his own men...on his way to hitting a wall. More People More Fun: Halo Reach, like the previous installments in the Halo franchise relies very heavily on its popular online multiplayer gameplay and utterly massive community. For years, the Halo series has been praised for its multiplayer action, and this time around it is no different. Reach features the same classic modes (in competitive multiplayer) you are used to such as Slayer (straight up Deathmatch), Oddball (everyone fights to hold a skull for as long as possible) and King of the Hill (your score goes up the longer you control the hill), but also has some great variants as well. Modes like Juggernaut (one player spawns as a super-fast, over shielded Juggernaut with a Gravity Hammer as a weapon, which is basically a one hit kill) and Infection (three players spawn as "zombies" and attempt to infect the other players by killing them) help mix up the multiplayer a bit and adds a good amount of replay value to the title. The multiplayer is very fast paced and action packed during the actual skirmishes, and the gameplay is quite great overall. Now, the thing you may notice about Halo Reach's multiplayer is that it is worlds apart from other hot multiplayer titles like Call of Duty: Modern Warfare 2, and there is no question that if you are coming over from a game like Modern Warfare 2 and are not familiar with the Halo multiplayer gameplay, it will be a couple of hours before you start to figure everything out. Even for veteran Halo players, there are still new things to learn because of the new additions to the multiplayer gameplay. There are a number of load outs that you can choose from, and each load out either has different weapons or different "Armor Abilities". The Armor Abilities range from having a Jetpack (obviously, you fly around the map using the Jetpack), or Sprint ability, to even being able to launch a duplicate decoy of yourself that runs around for a small amount of time distracting enemies. As I mentioned, the multiplayer is much different than pretty much any other multiplayer game out there, but that does not mean the gameplay is not extremely fun! Granted, it can be a bit...frustrating not knowing half of the things you can do or any of the map "spots", but once you get the hang of all of the gameplay elements it can be a very enjoyable experience. It is easy to see why Halo's multiplayer is so popular, and as a matter of fact Halo Reach's multiplayer community is absolutely massive. It is not uncommon to see 80, 90, 100 thousand players online at any time, and during "hot" hours of the day, the numbers can even reach 150K+! I do have one disappointment in the multiplayer though, and that is that the maps are just too large. In 4-on-4 or even 6-on-6 matches, the majority of the maps are too large and there is too much time wasted just running around the map looking for the map's hotspots. Rent vs. Buy: As a whole, Halo Reach has a ton to offer. Its visuals are incredible (some of the best on the Xbox 360), the audio has received a massive tune up and sounds better than ever before, the campaign is an epic and action packed journey very much worth playing through, the gameplay still manages to hold its value and keep the game fun, and overall Reach surpassed my expectations. Bungie has been serving up Halo games for 10 years, starting all the way back to Halo: Combat Evolved and has since improved in every single installment in the franchise in some way or another. If you have every liked a Halo game, Reach is easily a worthy title for the campaign alone (add in double and even triple the action with cooperative play up to 4 players).